Lucky Nine is a superb flag bearer in the Far East for his sire Dubawi and on 18 May he added a third victory at the highest level to his outstanding record when winning the G1 Krisflyer International Sprint for the second year in a row. Sent off as clear favourite to take the six-furlong contest, he was settled just off the pace under Brett Prebble (with whom he has enjoyed a tremendously successful partnership). Switched to the outside as the field quickened for home, Lucky Nine had the race sewn up in a matter of strides, storming clear to win easily. This was the 14th win for the seven-year-old who began his racing career in Ireland before relocating to Hong Kong. He has now won no fewer than nine Black type races, including the G1 Hong Kong Sprint and the Chairman’s Sprint – a local G1 contest that like today’s race, he has won for two years in a row. Bred by Darley, Lucky Nine is out of the Green Desert mare Birjand, a daughter of G1 Moyglare Stud Stakes winner Belle Genius. Birjand is also dam of fellow Black type performers Sudden Storm and Teehaff (both by Storming Home, who is based at Darley’s stud in Japan). She has a 2014 colt by Dubawi and returns to him this year. 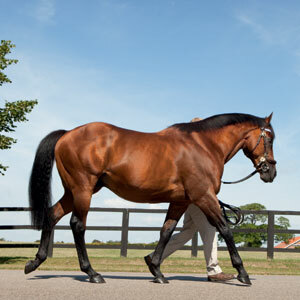 Dubawi, one of the world’s leading sires, is also responsible for this year’s 2,000 Guineas winner Night Of Thunder, plus 2014 G1 winners Prince Bishop and Tiger Tees. So far this year he has sired no fewer than 13 Stakes winners and a further 13 runners who have been placed at Black type level. He stands at Dalham Hall Stud at a fee of £100,000 October 1st Special Live Foal.